The modern trend from top-loading clothes washers to front loading washers and dryers has brought with it the need for pedestals for those washers and dryers to sit on. While it is possible to set them on the floor, bending down that far to access the wet clothing in your dryer negates all of the advantage of buying a front-load washer. Unfortunately, the pedestals designed to match those washers and dryers are an added expense and really don’t do much more for you. It seems to me, that if you’re going to have the washer and dryer sitting up, off the floor, then it only makes sense to find something to do with all that extra space underneath them. Most laundry rooms don’t have enough storage space as it is, so why not convert that space to storage, saving space and getting double-duty out of the pedestal. We can make such a base out of plywood, using baskets or bins as dirty clothes hampers or for storing laundry supplies. Either way, it probably makes sense to find the baskets first, so that you can be sure to build your pedestal so that there is enough clearance for them to fit inside it. The basic pedestal is going to be a box, with an open front. In order to for the pedestal to match the style of other cabinets, we’re going to raise the bottom shelf up off the floor a few inches, like a toe kick on a cabinet. However, it will not be inset like a toe kick; the wood rails will be right at the outer edge. In a sense, the top of the pedestal and the inside of it will be like two shelves, supported around the edge by the vertical part of the cabinet. But this box has to hold a lot of weight, so rather than making plain shelves, what we’re going to do is make a ladder support frame for them. That’s where we’ll begin. We need two almost identical plywood assemblies, one for the top of the pedestal and one for the bottom. We’ll use 1/2” thick plywood for these. The ladder frame will be made out of 2”x 3” dimensional lumber. These will probably look better than 2”x 4” studs, as they are not as common and give us additional vertical height that we can use for storage. The diagram below, for the top and bottom, doesn’t have any dimensions on it, because it has to be based on the size of your washer and dryer. Place them together, where they will go and measure the length and width. Ideally, you want the top of your pedestal to be the exact same size as the washer and dryer together. To determine the locations of the crossbars, simply divide the length of the platform by three. Our starting point for all our dimensions is the measurement you get off of your washer and dryer. The top of the pedestal, made of ½’ plywood, needs to match that dimension. 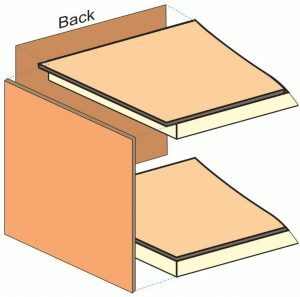 The framework for the top needs to be 2-1/2” shorter (1-1/4” on each end) than the plywood and 1-1/4” narrower, to allow space for the back and end panels and their frames. The bottom frame and plywood shelf need to be the same size as the top frame. The difference will be that the plywood will not overhang the front and ends, like it does for the top of the pedestal. Both the ends and the back will also be made of ½” plywood. As an alternative, you can use beadboard. This is plywood that has been milled to have a beaded pattern throughout. It is common for woodwork on nicer colonial style homes. The overall height of the pedestal is up left to your discretion. There are two things you want to take into consideration here. One is putting the washer and dryer at a comfortable height for working with them. This means having the center of the doors somewhere between waist height and chest height. If it is any higher than this, it will be hard to reach the controls. If it is any lower than this, it will be necessary to bend too much, in order to empty the units. The second consideration is the height of the baskets you have selected. You obviously need enough clearance for them to fit in the space you are creating. This means that the overall height of the pedestal will need to be about 7 to 7 ½” higher than your baskets. Cut the end panels and back to fit, and nail or screw them into place, attaching them firmly to both the top and bottom frames. The unit is usable as is, but it would be better to make it a bit stronger. This can easily be done by cutting scrap pieces of the leftover 2”x 3” dimensional lumber and attaching it inside the pedestal, at the four corners, screwing or nailing through the plywood sides and back. Don’t worry about the hardware being visible, as we are about to cover it up. These pieces of lumber will be the main support for the weight of the washer and dryer, so make sure they are attached in place well. To add strength and aesthetics to the pedestal, the ends are framed in with 1”x 4” frame and stile boards, as shown in the diagram below. Another 1”x 4’ rail is attached across the front of the unit, at the top, to hide the 2”x 3” dimensional lumber of the shelf frame. An additional piece of 1”x 4” is attached at the corners, to cover the 2”x 3” supports there. Once assembled, the base of the unit should be painted to match the room that it is going to be installed in. If your home has white trim, you may want to paint it white to match. Another possibility is to paint it whatever accent color you are using in the house. Use your imagination, you may even want to paint the plywood to match the walls, and the rails & stiles to match your trim or accent color. The pedestal should be finished out with baseboard to match your home. If your home has stained and varnished trim, you’ll want to paint the unit, before attaching the baseboard. If it is painted, you can install it before painting the pedestal. Rather than using baskets for storage or hampers in your washer and dryer pedestal, you could install cabinet doors or drawers. The only real difference in the construction for adding doors would be to install a dividing strips, essentially additional stiles, so that you could have something to mount the doors to. You wouldn’t want the doors to be more than about 18” wide, as cabinet doors that are wider than that tend to sag. Adding doors provides the ability to lock the storage under your washer and dryer, which may be necessary if you have small children or animals, which you need to keep out of the laundry chemicals that you will be storing under there. This would be much safer, than leaving those out in the open. Another possibility is to install drawers in the pedestal. Like the cabinet doors, drawers would require adding the additional stiles to the front of the cabinet. You would also need to add wood supports, behind those stiles, for the drawer rails to mount to. Drawers give you a little less storage space than an open design or even cabinet doors will, but they make up for that in the ease that you will have in getting to everything you have stored under there.